Trust me when I say it tasted much better than it looked. 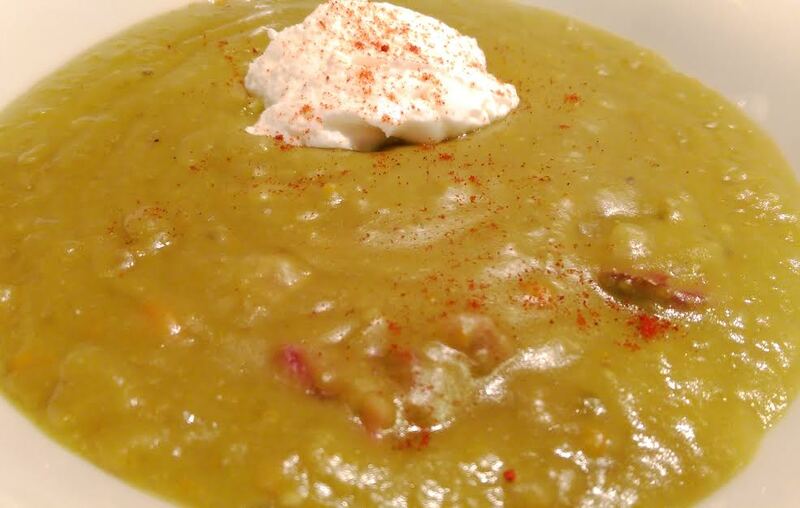 I had never made split pea soup before, but because Tara was partying it up with her friends on the Oregon coast, I took advantage of her absence by making myself food that she would never eat. Considering she’s such a picky eater all I really had to do was throw open the pantry, but I digress. So this was a smoky ham and split pea soup that simply cooked in the crockpot all day. I topped it with a dollop of plain nonfat Greek yogurt (who needs sour cream, anyway?) and a dash of smoked paprika. Good stuff! I’m assuming I’m not the only one who eats things they otherwise would not when their spouse or significant other is out of town? Feel free to weigh in on that (and share your go-to solo indulgence if you’re so inclined). I missed my wife, but made sure to keep busy over the long weekend. 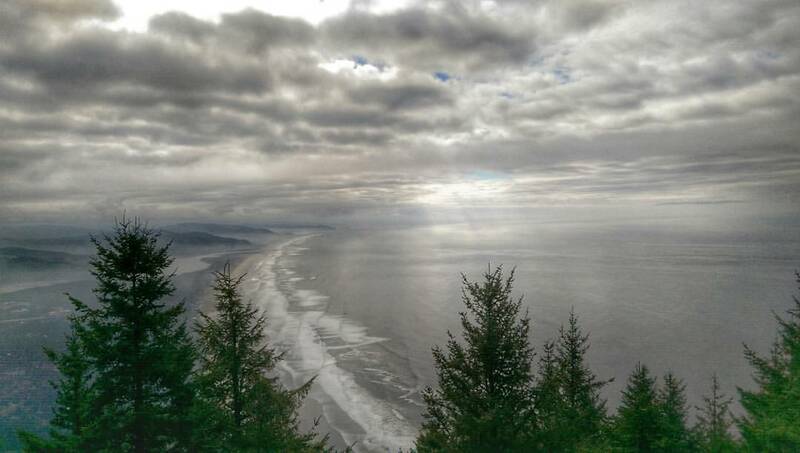 I took Friday off and drove to the Oregon coast for a hike up Neahkanie Mountain. The view from the summit was breathtaking, despite the thick cloud cover. After that I drove to Cannon Beach, where I proceeded to set up my beach chair and kick back with a magazine. Well, that lasted all of ten minutes, because it was cold as hell and started raining. So I returned to my car, changed into warmer clothes and a jacket, and walked past Haystack Rock and back. Because, why settle for a five-mile hike when you can add a three-mile walk to the mix? By then it was approaching dinnertime, so I drove half an hour south to Garibaldi. My destination? The Ghost Hole, a little dive-bar some coworkers told me about. I was a little intimidated when I first walked in because the place was clearly inhabited by locals, but I grabbed a seat by the window, ordered a Bloody Mary and a cheeseburger, and settled right in. Ended up staying for a couple more drinks before leaving. I thought I’d stroll around town for a little while afterwards, but it was dark, rainy, and cold. Too bad – I found Garibaldi to be quite charming. Tara and I will have to come back and do some exploring. Soft drink lobbyists testifying before Congress that soda is not unhealthy and is, in fact, part of a balanced diet. School lunch programs that are reliant on exclusive contracts with fast-food chains. Food manufacturers making up the lack of flavor in their reduced-fat items by doubling or tripling the amount of sugar. Companies targeting kids through false and misleading advertising. Parents enabling their own children by buying junk food or products they erroneously believe to be healthy. It’s somewhat maddening. Take the whole school lunch thing. It boggles my mind how different things are now from when I was a kid. Not only are there vending machines in the hallways; my daughter can order Taco Bell, Burger King, Pizza Hut, or Subway for lunch. In the cafeteria. WTF? We got choices, too: eat or don’t eat. That was it. 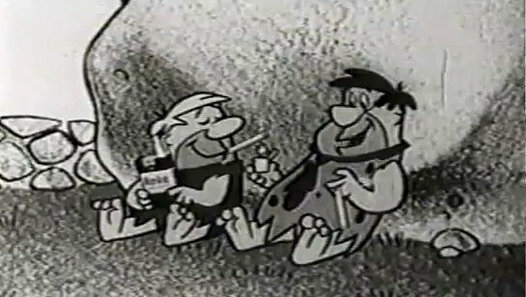 It was also interesting to see old commercials featuring Fred Flintstone and Barney Rubble smoking Winston cigarettes. And then they cut to the present day, where Fred Flintsone and Barney Rubble are peddling sugar-laden Fruity Pebbles cereal. Based on my own personal experiences, I already know that sugar is evil. This documentary really drove the point home. I highly recommend it to anybody interested in learning more about nutrition and how the “American diet” is contributing to so many serious health issues. Well, I thought your soup looked awesome on Instagram. That’s something I’d eat when my spouse is gone. Also, Stouffer’s creamed chip beef over toast. Sauerkraut over mashed potatoes. Yogurt parfaits. Tomato basil bisque with croutons. How does all that strike you? OMG…it is a must try! Good god….NO gravy! The sauerkraut and juices are the gravy! My mouth is watering just thinking about it. Ha! Well, I’m glad gravy is not part of the equation, at least. In an effort to protect kids with food allergies, my school system will not allow homemade snacks. The policy is designed to ensure that ingredients are shared in black and white with official labels, but it also means my kid is eating more packaged carbs than I’d prefer. Wait what?, your kid can get fast food crap for lunch at school?? I am mind-boggled, how is this allowed to even happen nowadays? It’s ridiculous, huh? Though in all fairness, I would have loved it at the time. And that’s precisely the problem! PB&J is the standard when I’m home alone, which happens less than it used to. One of my classes now is Nutrition. I needed a science with a lab, so, there ya go, nutrition it is. Of course, it is all about lipids and proteins and how many grams of this or that are on food labels. Carrie Rubin, another blogger you may recall I’ve written about has new book out entitled “Eating Bull” – it’s a thriller I am looking forward to reading. You, too may find it interesting. Sounds very interesting – both the class and the book. Let me know how it/they are! When my husband is away my go to meal is my all time favorite: tuna and noodle casserole. I make a big batch and can eat off of it for days. I know it’s not the healthiest but I love it and it has so many comforting memories of growing up. I can’t believe the school makes you send packaged snacks. I would rebel. What is wrong with an apple, banana, string cheese, box of raisins?? It makes no sense to me. Interesting info: My little granddaughter is highly allergic to all nuts. Her mom buys sunflower seed butter at Trader Joe’s and it is delicious. I love tuna noodle casserole! That’s another thing I don’t have very often. I actually can’t remember the last time. Nowadays I’d make it with whole wheat noodles, but I bet it would still be good! Ugh. I completely forgot about this magical meal and now I want to find the recipe and make 10 pounds of it. 10 pounds sounds just about right now that the weather is finally cooling off! I feel ya. Every time I’m proud of a crockpot creation I immediately want to take a photo but it always looks like mush. Delicious, delicious mush. I bet your poop erm, SOUP was amazing. Now that so much research is out there, and readily available, it’s fascinating to learn about the food industry and the marketing around it. I wonder about the rise in autism we’re seeing. Some have linked that to the processed food we eat. But what’s sad is that for families who struggle financially, it’s incredibly difficult for them to afford good food. The dollar stretches more when buying processed, easy food. You’ve hit the nail on the head, Jess. The documentary talks about the high out-of-pocket cost of eating healthy, and I’ve definitely experienced that firsthand myself. At least with budgeting, we can afford it. There are plenty of individuals and families out there who cannot, and turn to the Golden Arches instead. I feel for them.